It is one of those childhood-snapshots in your head, which are almost part of your DNA. The starring duo – well known to all Bulgarians – a small glass bottle of Boza (with a soft aluminium cover, like that sold in stores some 20-years ago) and a piece of warm Banitza next to it. With the paper in which the typical Bulgarian breakfast Banitza (puff pastry filled with white cheese) is handed over to you in, already spotted with fat from all the butter inside. The drink called Boza, the thick and sweet brownish liquid made of fermented millet grains with a low alcohol content (between 0.5% and 1%), is perfectly paired with Banitza because of the mix of buttery and sugary flavours. The consistency of the first sip is, well, an experience all of its own. After a few sips, you will either love it or hate it. The former may be divided into two groups. Some like its refreshing and sweet taste. If that’s you, buy and enjoy Boza in the first 24-36 hours after production. The second group prefer a fizzier and more fermented version. For this, leave the bottle outside of the fridge, in a warmer place, to enjoy six to 12 hours later, just when the bubbles start to pop on the surface! Of course, one may drink and enjoy Boza on its own, not really as a thirst quencher, but more as a liquid snack or on a hot summer day served cold and fresh. Either way, be prepared for a boost of energy after drinking it. Always buy Boza bottles that have been stored in the fridge, unless you want the fizzier and bubbly ones. The bubbly version might be a challenge to drink if you are not used to, so give yourself some time for this prickling experience. Boza is created via an alcoholic milk-acid fermentation of millet or other kind of cereal. The drink is quite calorific and contains several vitamins. For some months now in Sofia, one may find Boza made from other grains too, such as whole-wheat, rye, or spelt – and in plastic bottles. Despite having already tried a similar drink, called Kvas in Russia, it was with surprise that I learned that lots of other European and Asian countries their own versions too. 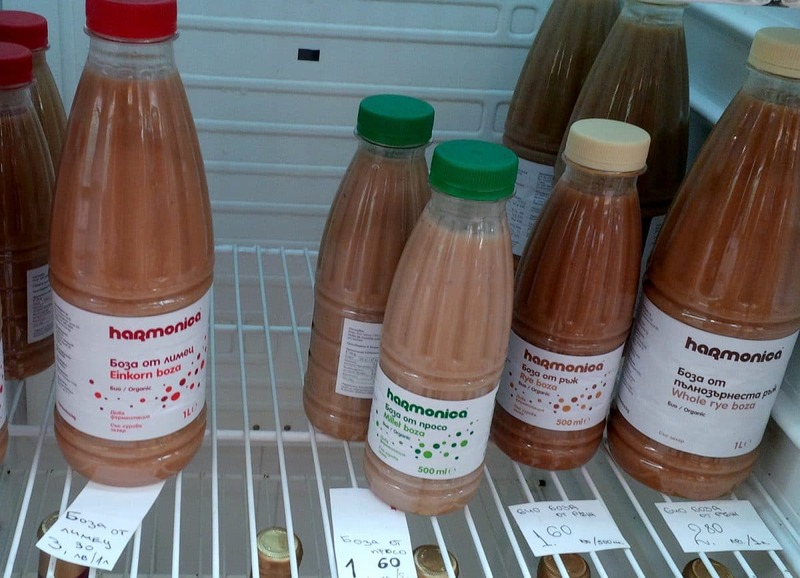 Boza seems to be a popular beverage in Kazakhstan, Turkey, Kyrgyzstan, Albania, Kosovo, Macedonia, Montenegro, Bosnia and Herzegovina, parts of Romania, Serbia, and as far north as Ukraine. Historically, Boza appears to have arrived in the Balkans and Caucasus from Central Asian Turkic peoples, sometime after the 10th century. The drink had a golden age during the Ottoman Empire. During this time, it was used in the army as a rich source of carbohydrates for the soldiers. According to the Turkish tradition, Boza is nowadays served mixed with cinnamon and roasted chickpeas on top or as a side dish.